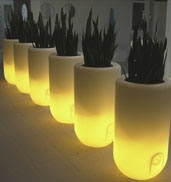 Lighted flower pots by Rob Slewe at Bloom! 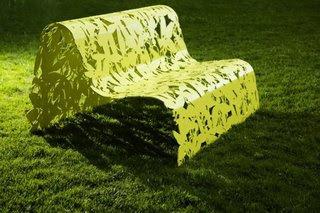 (from Europe but I've also seen these on ebay...) and garden bench by Thomas Alken (via pan-dan). Love the chartreuse, a color which should be used more in garden accents for its ability to blend with, but still stand out against, its darker green surroundings.